One of the things I’ve learned over the course of many trips to Israel is the glorious, deliciousness of the eggplant. Growing up, I had never, EVER been served anything with eggplant, and now I am sad about the many years I missed out on. 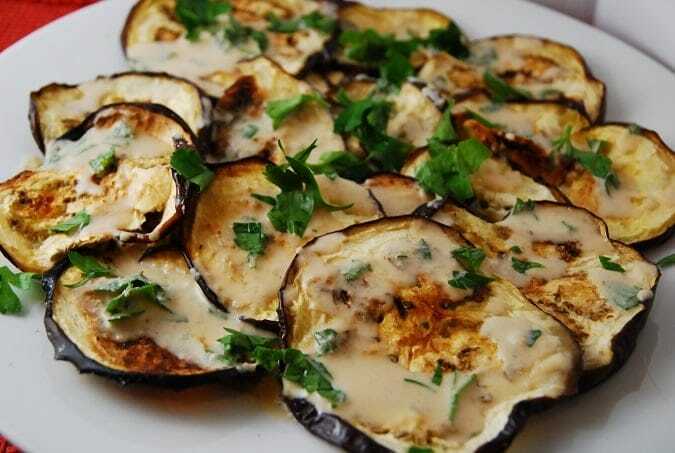 I love cooking eggplant now in a variety of ways, but one of my favorite eggplant recipes is this simple, yet savory Roasted Eggplant with Tahini Sauce Recipe. I love the smoky taste that the eggplant takes on when it’s roasted, and then the amazing and fresh tahini sauce drizzled over the top just makes it absolutely perfect. For those of you who aren’t familiar with tahini, it’s a thick paste made from crushed sesame seeds. Actual tahini sauce, which is used to accompany many middle eastern dishes, is a mixture of tahini paste, lemon juice, garlic, and water. I wish that I could say I was the master of making homemade tahini sauce, but to get the texture just right is a bit of an art form…an art form that I am still trying to perfect. But it is delicious and worth every attempt. These eggplant slices are great as a side dish to your main course, and also work really well as a sandwich topping too (on top of grilled chicken is my FAVORITE!) This tasty, low calorie recipe is loaded with fiber, making it a wonderful idea for Weight Watchers Recipes. Enjoy! you had me at eggplant! This looks so good. I’m going to have to try it out. Oh yes please! I’d love this for dinner.